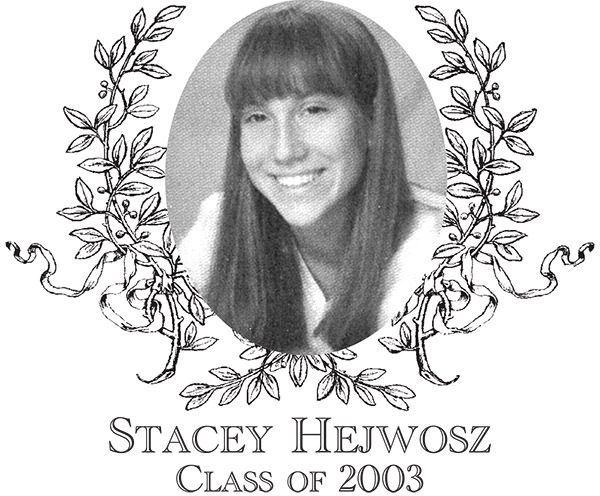 Stacey Hejwosz, Class of 2003, was a two-sport athlete for Bartlett. She displayed hustle, determination, commitment, and leadership, excelling in both basketball and tennis. Stacey played tennis her freshman through senior years. During her junior and senior years, Stacey was chosen as Captain and posted a stellar combined record of 32 wins and 3 losses. She was named team MVP twice and was selected to the South Worcester County League All-Star Team both years. Stacey's accomplishments in basketball exceeded those in tennis. She played basketball her sophomore through senior year. As a junior, Stacey averaged 14.3 points per game during the regular season, 18 points per game in the Mt. Wachusett Tournament, and 10 points per game during the District Tournament. Despite suffering a severe ankle injury during her senior year, she was still known for her quickness and outside shooting ability, scoring a total of 702 points during her career. Stacey was selected as Captain for both her junior and senior years, was chosen as MVP her senior year, and was selected to the South Worcester County League All-Star Team. Stacey was the recipient of the Athletic Directors' Association Award. Her excellence continued off the court as she was awarded the MIAA Academic Excellence Award, was selected to the Bartlett Super Team, was secretary of the National Honor Society, and ranked in the top ten of her class. Stacey continued her successful basketball career at Nichols College, where she received a Bachelor Degree in English, becoming the fifth all-time leading scorer and second overall for three-point shooting percentage. Stacey received multiple awards and recognitions for her achievements at Nichols, including the Stasia Czernicki Woman of the Year Athletic Award. Stacey is a Lead Preschool Teacher for Discovery House Preschool and currently resides in Shrewsbury.